For the past several weeks of posts, I have listed over a hundred local day camps for kids to explore Sports, the Arts, STEM, History, and Languages, in addition to specific camps for Preschool and Special Needs. (You can find them all here.) My kids love having the summer time to learn about these subjects, but what about me? When do I get to go to camp? I loved Girl Scout camp and YMCA camp as a kid, and I want to go to camp, too! I am so thankful for Family Camp! Boating and Fishing: Lake Cole is a beautiful lake on the southwest corner of the camp. We could take out paddleboards, rowboats, and kayaks. Our daughter (age 8) even went out in her own little kid paddle boat that was powered by her cranking the paddles with her arms instead of feet. Raft Building: Groups of families competed to earn supplies, such as giant plastic barrels, lengths of rope, and planks of wood. Then they used what they earned to make a raft. The kids climbed on, we floated them out onto the shallow edges of the lake, and they paddled it around! Theater/Music: My daughter and I took several theater and music classes, including improv, how to write your own songs, and musical theater. There was also a talent show for kids and one for adults. Flying Squirrel: This is a giant swing hanging from a rope strung high up between two trees. Kids and adults take turns strapping in and being pulled like a sling shot, then swinging through the trees. 3D Archery:We are definitely NOT a hunting family, but we all thought this was really cool! Just down the road from the main camp is a 3D archery course. You walk along the paths and look for one of the 18 foam animals just inside the woods. You aim for the foam animal, and score three points for hitting the bulls eye on the foam animal, 2 points for hitting the circle around the bulls eye, and 1 point if you hit it at all. Japanese Cultural Exchange: Frost Valley has a special Tokyo YMCA partnership. During the regular summer children's camp and throughout the year, they have special programs for Japanese children and families living in the United States. During Family Camp week, they have some programs to share Japanese culture. 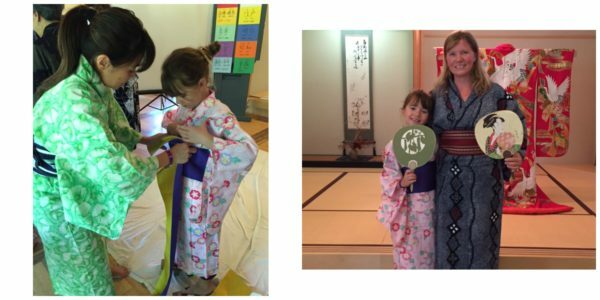 My daughter and I attended a class on how to put on a yukata, a summer cotton kimono. My daughter felt so special wearing it. It was a beautiful class, and we both thoroughly enjoyed it. While most activities were for parents and kids to do together, there were a few opportunities when the kids could be with camp counselors and the parents could have time on their own. One evening, you could sign up for your kids to spend the evening with the counselors, playing games and doing a scavenger hunt around camp, and then sleep under the stars! This evening, my husband and I enjoyed a peaceful evening sitting at the lake, taking a creative writing class run by a published author, reading, and watching beavers gathering some branches for their den. The accommodations are varied, including platform tents, individual cabins, lodges with shared bathrooms, and hotel rooms. All families eat together in the dining hall, and were assigned to sit at a specific table. Some families who come year after year even brought tablecloths and flowers for the table! (And, when I say "year after year," I really mean it -- there was one family that has been coming for 40 years and brings four generations now!) The food was pretty good, especially considering there are over 400 people being fed at once! Mussels in wine sauce on the first night and we were hooked! My son, who has severe allergies to peanuts and milk, especially loved the food. The camp is peanut-free, and there was always a dairy-free food option, including dessert! They were so accommodating to his allergy! In addition to Family Camp at the end of the summer and kid summer camp throughout the summer (including Kidney Camp for children with chronic kidney disease, Tokyo Camp for children from Japan who are now living in America, and a mainstreaming program), Frost Valley has weekend retreats for individuals and families throughout the year. We may try one of these family retreat weekends one day, too, but I know that we are all looking forward to our August Family Camp at Frost Valley again this summer!